These birds are large, but there is little to them. They are skin, bones, and feathers. That’s why you rarely see a decent head on photograph, they disappear. You must be at an angle to get them (or Great Blues) flying towards you. 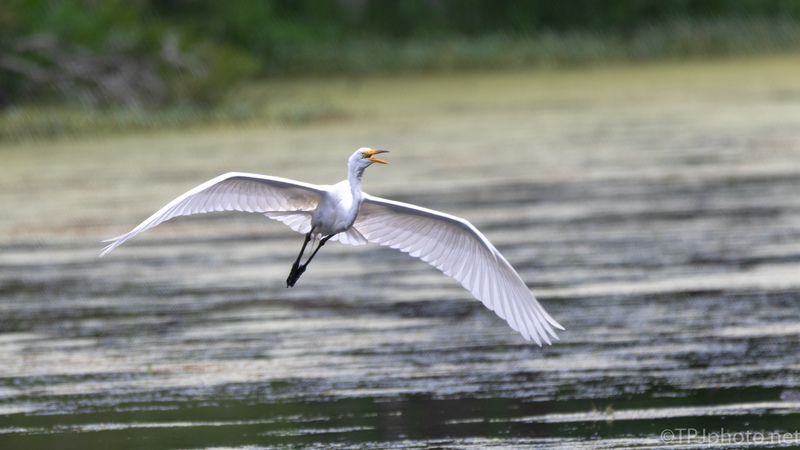 Above is an Egret flying into a swamp rookery from the woods. They will drop down from tree top, come in low, and finally climb to the nesting trees. Below is a series of photographs taken following the Egret as it flew in towards me, finally twisting to climb. Magnificent birds. I really like the wings and feathers. Very nice shots, Ted! The feathers, especially during mating season, are beautiful. And that is why they were almost extinct in the 1800s. Used the feathers for hats. They were sold by the pound, which meant untold numbers were killed. Really, how much does a feather really weigh ? I like the legs and feet. Reminds me of a human diver getting their body in the right confirmation for that perfect dive.